John McCain's top field general, Mike DuHaime, has been here before. Just 10 months ago, he was managing the ill-fated Rudy Giuliani campaign for President, fending off daily questions about declining poll numbers and dimming prospects. As the data went south, DuHaime never soured in his public predictions. "We feel extraordinarily good about where we are," he said over and over, in different iterations, as Giuliani's languid campaign performance turned off voters in state after state. DuHaime called certain New England states "momentum-proof," while saying he felt "very good" about other states, like Florida, that Giuliani would eventually lose. At some point, reporters covering the race could no longer handle it all with a straight face. Now DuHaime, who is considered one of the brightest lights in Republican campaign management, finds himself playing the same role for a different candidate. "We feel good about things," DuHaime told reporters late last week in a conference call after the McCain campaign decided to dismantle its Michigan operation, where it trails Barack Obama in the polls. He said he remained "confident" about a Florida win by McCain, not to mention a Republican victory in once reliable states like Virginia and North Carolina. If DuHaime is to be taken at his word, he counts himself among a dwindling handful of Republican strategists who feel either "confident" or "good" about the current state of the race. Over the course of two weeks, as the financial crisis and faltering economy have taken center stage, the electoral map has shifted sharply away from McCain and toward Obama. States won by President George W. Bush in 2004 that seemed to be trending Republican after the convention, like Ohio, Florida and Virginia, are now shifting back to Obama in public polls. Other Bush states, like New Mexico and Iowa, appear to have moved safely into the Obama column. In recent days, party leaders in Florida and Virginia have voiced their concern about the trajectory of the race in their states, while Michigan activists voiced bewilderment and frustration that McCain was already giving up on the battleground state. Even Karl Rove, the architect of President Bush's victory in 2004, now says Obama has enough Electoral College votes to win the White House. According to Rove's reading of state polls, just seven states are toss-ups at this point  Nevada, Missouri, Indiana, Ohio, Virginia, North Carolina and Florida  all of which Bush won in 2004. "If the election were held today, Obama would win every state John Kerry won in 2004, while adding New Mexico, Iowa and Colorado to his coalition," Rove announced on his blog Sunday. Peter Brown, an independent pollster of swing states at Quinnipiac University, put the McCain problem into stark historical relief last week, when he released polls from Florida, Ohio and Pennsylvania, which all showed McCain slipping. 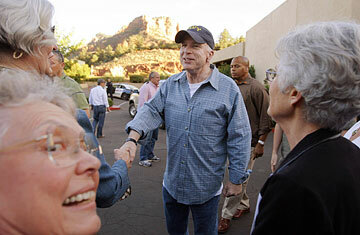 "Senator John McCain has his work cut out for him if he is to win the presidency," Brown said. "There does not appear to be a role model for such a comeback in the last half-century." With a month left, McCain still has time to reverse the recent trend and make election night a nail biter. It was only a few weeks ago, after all, that it was McCain who had soared in national polls and Obama who was dealing with panic in his party. But McCain's campaign is now stuck playing defense. Over the weekend, his running mate, Sarah Palin, held a rally in Nebraska, a traditionally safe Republican state, but one where electoral votes are distributed by congressional district; Obama hopes to steal one such vote in the more liberal Omaha area. On Tuesday, Palin is scheduled to appear at a rally in North Carolina, another traditionally Republican region that Republicans once hoped they wouldn't have to invest time and resources into. To counteract the hardening environment, the McCain campaign has begun to shift strategy, hoping to change the subject from the economy's woes to questions about Obama's character and readiness to lead. Over the weekend, it unleashed a torrent of fresh attacks on Obama, including a claim by Palin on Saturday that Obama was someone who would "pal around with terrorists," a reference to Obama's limited relationship with William Ayers, a former violent antiwar activist who now works as a professor in Chicago. The claim, which is supported by campaign ads that ask "Who is Barack Obama?," follow a plan of attack that some Republicans outside the campaign have characterized as the "Manchurian candidate" strategy. By raising questions about Obama's past associations, the campaign is working to raise doubts about whether the Democratic nominee is the man he says he is. The Obama campaign, by contrast, continues to invest heavily in positive issue-oriented advertising, including spots that describe Obama's economic and health-care plans. At the same time, Obama has been hitting McCain on the stump, charging that his campaign is running away from the real issues to launch "Swift-boat style" smears. In one recent advertisement, the Obama campaign quotes an editorial saying McCain has shown "erratic" leadership over the past two weeks. All this posturing comes as the candidates face only two remaining major events before Election Day: a presidential debate Tuesday in Tennessee and a joint forum on Oct. 15 in New York. In the meantime, no matter what the poll numbers show, campaign aides like DuHaime will be forced to talk up their optimism going into the final days. Last Thursday, McCain senior adviser Greg Strimple tried to highlight the fact that Obama too has had to pare down his initial goals for the election. "Obama started off with a 50-state strategy," Strimple said. "We've seen him pull out of Georgia [and] North Dakota. And I hear he is down 9 [points] in Montana." Such marginal changes, however, do not change the fact that, as things currently stand, Obama appears poised to win the election, possibly by large margins. Victories in Georgia, Montana and North Dakota would offer McCain little consolation with a President Obama in the White House.